Caring for a loved one with an eating disorder is a difficult task; carers often find it hard to cope, and this can contribute to the maintenance of the disorder. 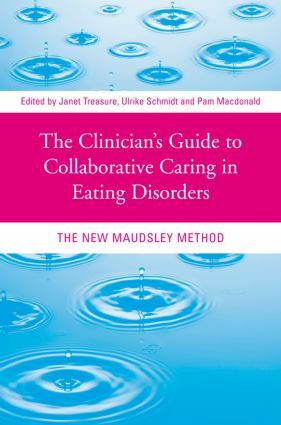 The Clinician's Guide to Collaborative Caring in Eating Disorders shows how active collaboration between professional and non-professional carers can maximise the quality of life for both the sufferer and all other family members. The book provides straightforward guidance for clinicians who work with families and carers. It suggests ways of ensuring that interpersonal elements that can maintain eating disorders are minimised and indicates skills and knowledge that can be taught to the carer for both managing their personal reaction to the illness, and for providing a practically and emotionally supportive environment that is conducive to change. The appendices of the book contain a Toolkit for Carers, a series of worksheets designed to help carers recognise their own unique caring styles. This book is worthwhile reading for all health professionals working with people with eating disorders. It is relevant across a variety of settings and client groups including inpatients, out-patients, community and day patients. How do families cope when a relative has an eating disorder?